This article is about the municipal town under the jurisdiction of St. Petersburg, Russia. For the palace complex, see Peterhof Palace. 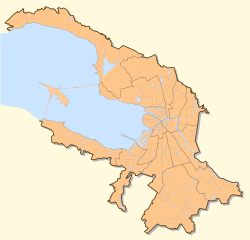 Petergof (Russian: Петерго́ф) or Peterhof (German for "Peter's Court"), known as Petrodvorets (Петродворец) from 1944 to 1997, is a municipal town in Petrodvortsovy District of the federal city of St. Petersburg, located on the southern shore of the Gulf of Finland. The town hosts one of two campuses of Saint Petersburg State University and the Petrodvorets Watch Factory, one of the leading Russian watch manufactures. A series of palaces and gardens, laid out on the orders of Peter the Great and sometimes called the "Russian Versailles," is also situated there. The palace-ensemble along with the city center is recognized as a UNESCO World Heritage Site. The dominant natural feature of Peterhof Grand Palace is a sixteen-meter-high bluff lying less than a hundred meters from the shore. The so-called Lower Gardens (Nizhny Sad), at 1.02 square kilometers (0.39 sq mi) comprising the better part of the palace complex land area, are confined between this bluff and the shore, stretching east and west for roughly 200 meters (660 ft). The majority of Peterhof's fountains are contained here, as are several small palaces and outbuildings. East of the Lower Gardens lies the Alexandria Park with 19th-century Gothic Revival structures such as the Gothic Chapel. as well as 12 dormitories and a number of infrastructure objects. The Petrodvorets Complex dates back to 1960s when it was decided[by whom?] to copy best international practices and to construct a brand-new suburban campus for the University, which had a crucial need for new premises. However, the idea was said to be widely opposed by the faculty, who did not want to commute two hours a day, and as few as four faculties relocated to Petergof. In the 1990s the number of students from other regions fell significantly, and the University sold many of its downtown dormitories. When the trend reversed, the need for housing made the University administration accommodate most students in Petergof, even those studying in downtown faculties, which has created certain tensions. Still, the idea of a suburban campus seems to be persistent, as the Government of the Russian Federation has decided to hand over the Mikhailovka estate to the University to reconstruct it and house the Graduate School of Management's campus. Due to the extensive presence of research facilities, mainly belonging to St. Petersburg State University, Petergof was named a naukograd in 2005. Russia's oldest factory was founded by Peter the Great in 1721 first as a lapidary plant to help in the construction of the Peterhof Palaces but also other Palaces in St. Petersburg. It started to produce equipment and parts for the watch industry in the 1920s. After World War II, the factory started to produce complete watches under the brand name Pobeda and from 1961 under the brand Raketa. in 1985 the factory had 7500 employees and was producing 5 million mechanical watches per year. Today, it is the last watch factory in Russia producing its own movements from A to Z, though the production is much smaller than it used to be. The town is served by three railway stations (Novy Petergof, Stary Petergof, and Universitet). The palaces of Peterhof are accessible by sea via hydrofoils based near the Winter Palace in St. Petersburg. The palace is also easily accessed by road. Public transit and private van services make regular trips from Saint Petersburg. The Upper Gardens are freely accessible, but entry to the Lower Gardens requires the purchase of tickets (not included in the boat fee for visitors arriving by hydrofoil). The palaces and grotto are accessible only as part of guided tours. ^ "Portal of St. Petersburg State University". ^ "History of Petrodvorets Complex (in Russian)". Archived from the original on August 23, 2010. По первоначальному замыслу новый университетский городок, который планировалось построить южнее Старого Петергофа на участке в 666 га, должен был включить в себя все естественные и гуманитарные факультеты, их научно-исследовательские институты и остальные подразделения Университета. Но эта мечта оказалась слишком дорогостоящей, и тогда союзным правительством было принято решение о проектировании и строительстве в Петродворце в первую очередь трех естественных факультетов: физического, математико-механического и химического, вместе с их научно-исследовательскими институтами. ^ "GSOM's campus in Mikhailovka (in Russian)". ^ "Naukograd Petergof (in Russian)". Archived from the original on January 17, 2011. ^ Documentory about the History of the Petrodvorets Watch Factory "Raketa", Russian with Eng subtitles. ^ facts and articles about the History of the Petrodvorets Watch Factory "Raketa", in Russian and English. Wikimedia Commons has media related to Peterhof. Wikivoyage has a travel guide for Peterhof. Wikisource has the text of the 1911 Encyclopædia Britannica article Peterhof. King, Greg (2006). The Court of the Last Tsar (hardback). Hoboken: John Wiley & Sons. pp. 559 pages. ISBN 978-0-471-72763-7.